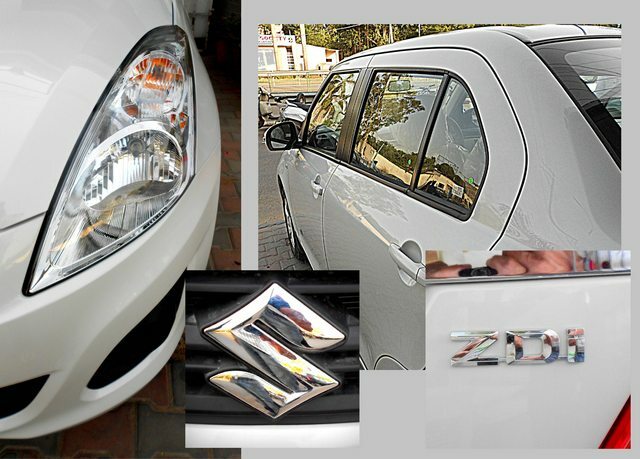 Got the delivery of All New Maruti Suzuki DZire ZDi, this Monday. Awesome car & pixs, expecting a lot more. Heyy Nishu... Congrats budyyy ... Finally u get ur vehicle after a long long wait..
Ahh...finally! This is the culmination of longest wait/research on ACI-forums. Congrats, detailed pics. & review eagerly awaited. A Big Congrats man after really lot of research and long discussion. So you should give party to all the ACI forum members who have contributed for your decision. Doc saab! What a great buy - Congratulations . Now that the beauty is in your garage, give us some 360 Degree pics of the ride. No more teasing with the teaser pics !! 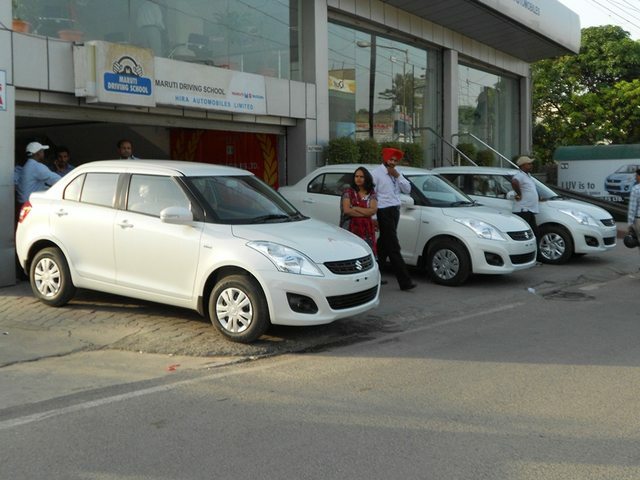 Also please share your experience with the Maruti Dealership and the initial ownership too. Expecting alot from your side. nice color choice & white looks really cool. wish you many more safe & happy miles. Congrates Dr. Nishu. Happy to see that your search is finally over. Let a lot of detailed pics of both exterior and interior come in with your initial experience of the car. Congo dr nishu !! Finally you have your perfect car , waiting with baited breath for details pictures of car along with initial ownership report . Congrats once again Nishu. Lets put some more pics. Hey congrats man.... You really waited very long and I highly appreciate your ability to wait... Congrats again for a wonderful car. I am happy on one more count. You got it before the proposed increase of rates. Luck hai boss. Congrats. And, enjoy the new vehicle. Drive safely. And, ENJOY. but the thought of buying the New car began even half an year before that. 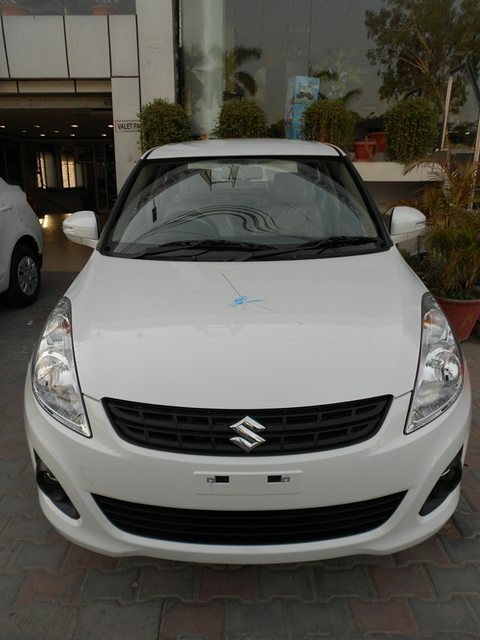 So, after posting thread at AAA in Autocar India, I quickly took the decision to book All New Swift ZDi, even a month before its launch i.e On 18th July 2011 & left over the final decision of my purchase for its 7th month long Waiting period & finally it worked. 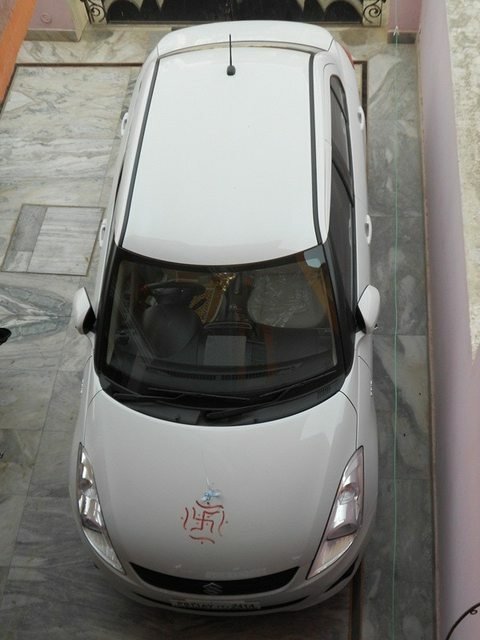 Initially I focussed on buying Swift ZDi as soon as possible(more precise it was around Diwali 2011) to prevent price hike & to flaunt it at my Nearest Cousin's wedding. But thanks to Maruti Suzuki's 3 month long labour strikes & Dealer waiting queues, which have made this scenario to happen it another way. Then came 2012, pushed dealer again to deliver my Swift ZDi but In the region of flashy-flaunting & very rich people, my car's delivery date got delayed, delayed & delayed. Then came Feb2012 & the launch of New DZire, immediately on its First Drive pics, I planned to shift my booking to that car, thanks to its better appointed Black-Beige Interiors, Better rear seat comfort, Better boot space, Better Suspension & hence Better Stability(i knew it about them since its launch & it actually showed after buying it). Yes buying, in reality I haven't did the TD of DZire diesel before my purchase. Only Test drive its ZXi petrol version twice. Even on the consent of Dealer, which offered me to buy the DZire instead of Swift ZDi with promised lesser waiting time, I shifted my booking. But sudden surge in the demand of New DZire & shortage of Z-variants parts at Maruti Suzuki made me to wait for the car actually more than it had to be. 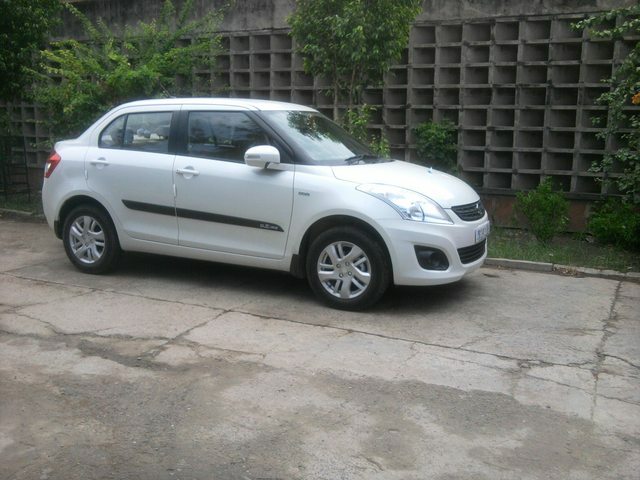 Then on 4rd May2012, I got the call from the Dealer that my Arctic White DZire ZDi arrived, but due to my busy schedules & other family reasons, I got the need to postpone my purchase by another month. 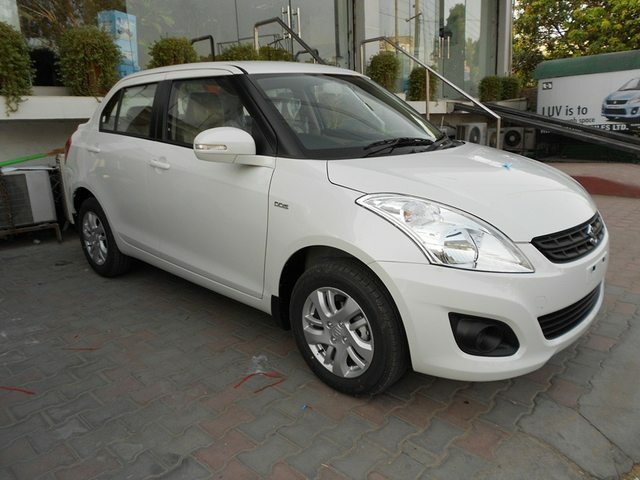 Then came June 2012, Dealer called me again that my Arctic White DZire ZDi has arrived in their Stock yard & fixed the delivery date mutually on Monday, 11th June 2012. Hospitality at dealer was great. 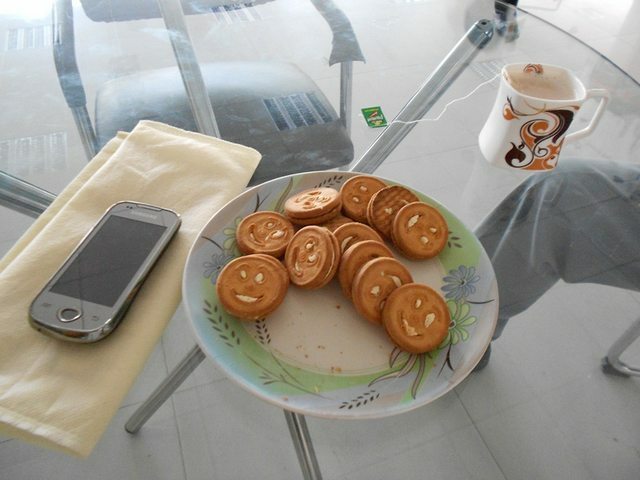 On reaching the showroom, SE greeted us with Booking/Delivery file in his hand & offered us other bits from Water to Soft Drink(Rasna ), Tea & a plate of Biscuits. SE did everything from showing us the car to handing over all the papers till delivering the keys of the car to us. Whole attending dealer staff was very helpful, courteous & Polite till whole of the process & have really made me to forget all the 11month of waiting period frustration with them. 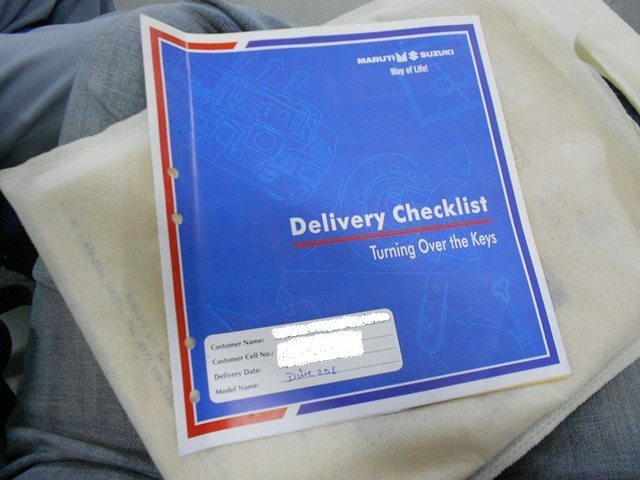 After completing all the formalities, Before taking the delivery SE handed us the Delivery Checklist booklet to ensure all the essentials availability in the car. 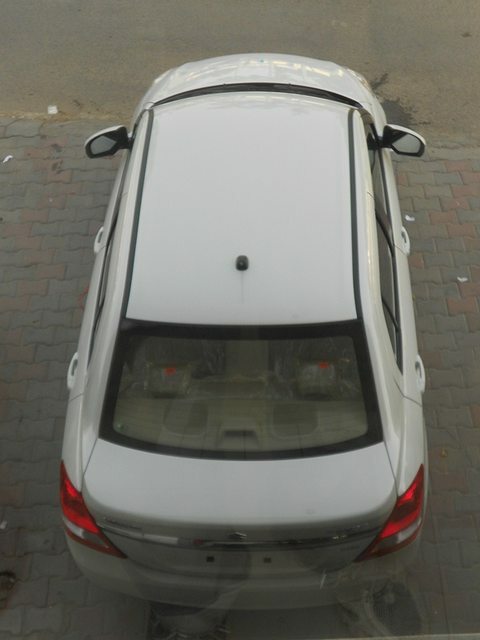 Btw, A top view of my car from the Showroom's 1st floor, before taking the delivery of the car. Hearty congrats Nishu' date=' Awesome car & pixs, expecting a lot more. Exactly Same pinch n Thanks goenkakushal. Ahh...finally! This?is the culmination of? longest wait/research on ACI-forums. Congrats' date=' detailed pics. & review eagerly awaited. Presented above, as the doctor ordered. Come to my place & we'll definitely be having a fun. Doc saab! What a great buy - Congratulations . Now that the beauty is in your garage' date=' give us some 360 Degree pics of the ride. No more teasing with the teaser pics !! Your wish already came true above. Rest in on the way. congratulations dr_nishu...nice color choice & white looks really cool.wish you many more safe & happy miles. More pics to arrive soon. Yes definitely I'll as will clock more & more miles. Bank walon se darr lagta hai, saheb, will post the complete details soon. Rest mine is still delayed as we got out car after 2 price hikes(Excise hike+ Introductory price withdrawal hike), totalling upto Rs.~26k. But still its okay. Rest, thanks everyone for wishes & suggestions. Thanks to ACI-ian, librankur also, whose words made me to decide it on the straight-forward manner. Was a bit busy with my admission an all,so could not find the time to congratulate you on your new buy. Your patience paid off. Many many congratulations on the new buy. I wish a safe and happy ownership. Yes, I want to see more pics too and day to day updates. @Nishu: Congrats on the 'sensible' buy. This car ticks all the right boxes. Drive safe and keep us posted as to how it behaves in the long term. Aapko tho biscuit and chai pilathe hai dealer log. Aur, aap bolte hai ki `hum aap jaisa bankers se darthe hain'. Yeh kya baath ho gaya bhai ? Sorry guys, I started talking in Hindi. 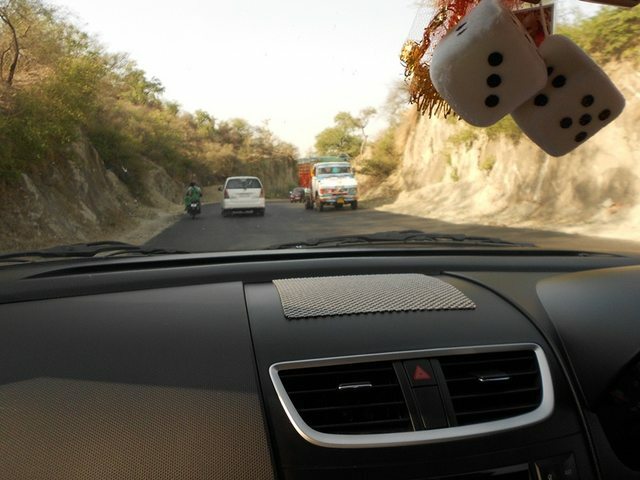 I could not help it as we are now on a 20 day trip to Bhimthal-Nainithal-Delhi in this hot, dusty and humid summer. Aadat se majboor hai. Maaf karna. I see you have brought your SNOW WHITE home.It went missing in the woods for over an year now. Many Congratulations to you and your family. With this one in the bag i would like you to enthrall us with the accessories you planned for this beauty aka GPS , RPS and the likes , will be waiting for your post on the said thread you started. Thanks sb' date=' DD, neerajd. Will try to give as much info as possible as I can. 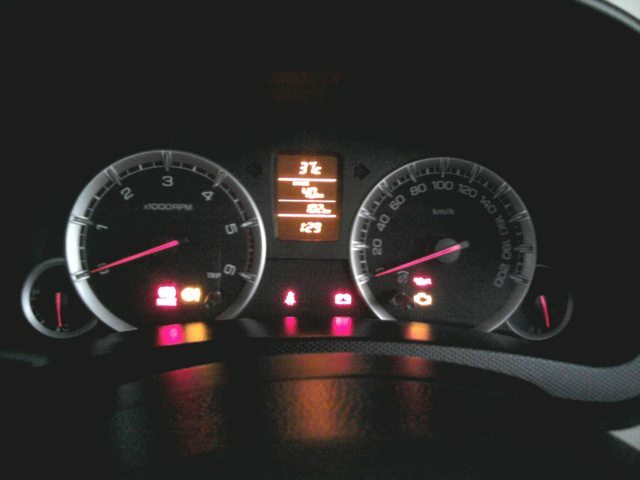 Till to date, I haven't used the car much & its only 230kms Old now. Instantaneous FE display have jumped to 28-30kmpl on Highway drives @80-100kmph in 5th gear, from 18-19kmpl Initially. Might be due to smoothening of the engine parts. Actually, the Dealer from which I've purchased the car has been rated as one of the best in Showroom/Dealership dealing & Hospitality in our state. Even I got a Special feedback call from them(2 days after the delivery) for Dealer Hospitality experience. So, I guess its their routine job, ha. Book a car here & you'll also be greeted by the same. ?Many Congratulations to you and your family. Got the time spare to fit Door protecting strips, Car perfume & Floor mats only. All other accessories are due soon & will update as I get them Installed. What an impressive review.Hats off to you Doctor sir.BTW,How much your Dizzy had done. The car at showroom was in very Neat & Clean condition, with Exteriors cleaned superbly & dashboard plastics properly cleaned & polished. I tried to inspect its everything as per the Checklist, the dealer provided to us. At the time of delivery the Odometer of the car was at 14km, as per dealer it was due to PDI & their local transportation(from their stockyard to showroom). Driven the car 100km very first day, at almost every speeds. -Engine on that day felt somewhat tight & needed some healthy mile munching to smoothen it up. Initially, the Turbo lag was also much higher & it responded at ~2200Rpm. -But what Surprised me is its Brakes, about which I was very much doubtful. I've tried them on 120kmph of very first day. Upto which they're having the stopping power & they can handle the situation in their 2nd-gen ABS avatar. 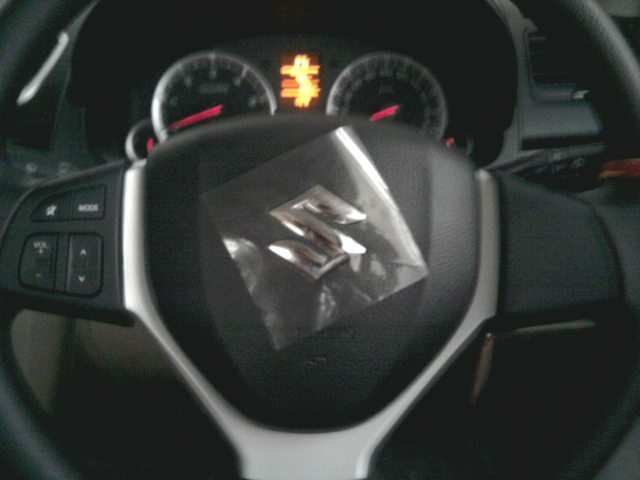 Thanks to ABS suppliers for Maruti Suzuki DZire. FE as displayed on its MID was ~9.0kmpl(avg), while the Instantaneous FE hovering nearly around ~15 kmpl. But it was okay since the car was few kms old. Seating Comfort was Good, with most lovable element for me is Rear Seat centre Armrest. Engine Refinement is improving day-by-day & km-by-kms as the car is clocking. Turbo lag has improved & due to smoothened engine, it starts building serious amounts of power from 1500-1600 Rpm, with its full boost at ~2300 Rpm which keeps on pulling till 3000 Rpm. Smart & well-chosen Gear ratios, also do their magic alongwith its Torquey & silent engine. Afterwards 3000-3500 Rpm, its power delivery becomes flat as per revs increase. Steering is well weighed with Rack-mounted EPS unit, which provides its Super-light feel & road dampening with excellent road feedback levels. Clearly, its having one of the best steering feel & feedback under Sub-10 lakh Rs cars. Suspension is also good & it never makes the car to loose its line/composure even after crossing minor undulations/potholes at triple digit speeds. 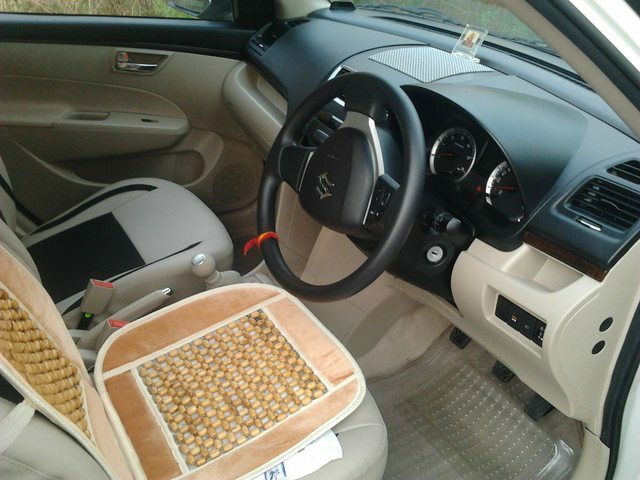 With Superb noise dampening & Black-Beige interiors, its cabin is almost a Drawing room to chill on. My DZire ZDi, which is having Auto AC & 7-Speed blower, does its job well to cool the cabin at 1st or 2nd speed of blower even in scorching June-July of Northern Summers(48 degrees Cel.) to be more precise. Instantaneous FE is now hovering from 12.0-30.0kmpl as per Rpm/accelerator inputs. & Average FE is still around 15.9kmpl. While the actual FE seems to be somewhat near to this also, i.e. 16-17kmpl. Will wait to improve it further, as it'll clock more & more kms. 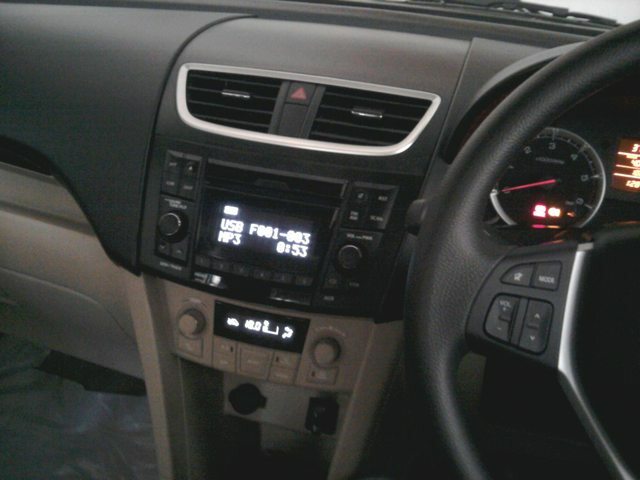 Its having stock NIPPON HU with NIPPON 6-speakers(2 tweeters +2front door speakers +2 on rear shelf) all around. Illuminated Steering wheel Audio controls are also standard & are boon for easy to operate while driving. Another best feature its having is 3-stage AVC (Auto Volume control) which varies its Volume as the speed of the car varies. What's not good here is ! -HU USB mode plays Audio files with 128kbps or 160kbps or 320kbps bitrate only, anything another to this, will not be recognized. -It supports USB drive upto 4 GB only. -Rear speakers are Paper-cone type & aren't much great to listen while on the Rear Seat, while front speakers are Simply Awesome. I guess, these pros & cons about the Music system are same with Ertiga & Swift ZDi, as its a shared unit. -4GB Strontium USB(got it from Snapdeal). -Non-Slip dashboard mat(got it from Snapdeal). -Rear Parking sensors(type-II) with Parking sensor display screen. -MGA Door side moulding strips. though I'm having one hanging type but its having not much Aroma with it now, so trying to explore others today. Probably be going in for India's Ambi-Pur once again. -Sub-woofer or JBL Bass tube. It has clocked almost 1300kms till to date.